After the death of John Lennon, Spector retreated to his mansion and spent the majority of the 80’s as a recluse, rarely seen and spending most of his time indoors. In 1982, Spector had twins with his then then-girlfriend, Janis Zavala: Nicole Audrey Spector and Phillip Spector. Although he had already adopted three children with ex wife Ronnie Spector in an attempt to keep their marriage together, he barely saw them and didn’t seem to have much affection for them. With the arrival of his paternal offspring, Spector seemed to come out of himself more, and be filled with the joy of life again. He spent the next decade looking after his children and watching them grow up, he was especially fond of his son Phillip. In 1989 Spector was inducted into the Rock and Roll Hall of Fame, for his renowned music production work in the 60’s and 70’s. He was nervous when he arrived at the ceremony, having not been out for such a long time, and drunk too much, giving a rambling acceptance speach. On Christmas Day in 1991, his 9 year old son Phillip Jr died of leukemia. This tragedy caused Spector to become even more withdrawn, and he never seemed to recover from this terrible loss. During the 90’s he was generally out of sight, although he did attempt to produce a Celine Dion album in 1995, full of wall of sound type production and soul numbers. It wasn’t to be, however, as disagreements with Dion’s manager (and husband) caused the project to be shelved, another producer took over and Spector went back into obscurity. The bands management eventually made it clear to Spector that it wasn’t working out. He was heartbroken, as he truly believed that this band would be the way for him to reclaim his crown as the production king. But it wasn’t to be. In February 2003 the ex actress Lana Clarkson was working part time in a restaurant called The House of Blues. She had had minor success in a few B-Movies during the 80’s, but was now struggling at the age of 40 to break into the acting world. At the end of the night Phil Spector came into the restaurant, seemingly very drunk. He asked if Lana would come back to his mansion with him. Clarkson initially refused, saying that she wasn’t allowed to take rides with customers, but at some point she decided to go back with Spector. They were taken back to Spector’s mansion in his limousine, driven by Adriano De Souza. Once they arrived De Souza waited in the car as Spector and Clarkson went up the steps, she supporting him as he drunkenly staggered to and fro. Looking past him into the hallway De Souza could see Lana Clarkson slumped in a chair with blood covering her face. Badly shaken the driver went back to his car, drove to the entrance and called the police. When they arrived they found Spector in a confrontational mood and had to fire a tazer at him to arrest him. He was arrested and put on bail for $1 million while awaiting trial. Spector gave many interviews before his trial, claiming his innocence. The trial began in March 2007, delayed because Spector changed his defense attorneys 3 times, a tactic often used to delay proceedings, enabling memories to fade away from witnesses. His defense claimed that Clarkson killed herself because she was depressed at having not made a career in Hollywood. The words “I think I killed somebody” were also refuted, the defense arguing that De Souza has a tentative grasp on the English language and misheard what Spector actually said. There were many experts and doctors in court, saying that if Spector had shot her with a gun from 2 feet away there would have been more blood on his suit. Their claims were put in a different light when it was revealed that they were each being paid handsomely by Spector himself. During each hearing, Spector wore increasingly outlandish wigs, which have now become almost iconic. On September 2007 the judge declared a mistrial due to a hung jury, 10 jurors believed he had killed Clarkson, but 2 could not say without reasonable doubt that he had done it. The retrial for second degree murder began in October 2008, and on April 13th 2009, the jury found Phil Spector guilty. He was immediately taken into custody and was formally sentenced to 19 years to life in the California state prison system. Spector will be 88 when he is considered for parole, whether he makes it that far remains to be seen. 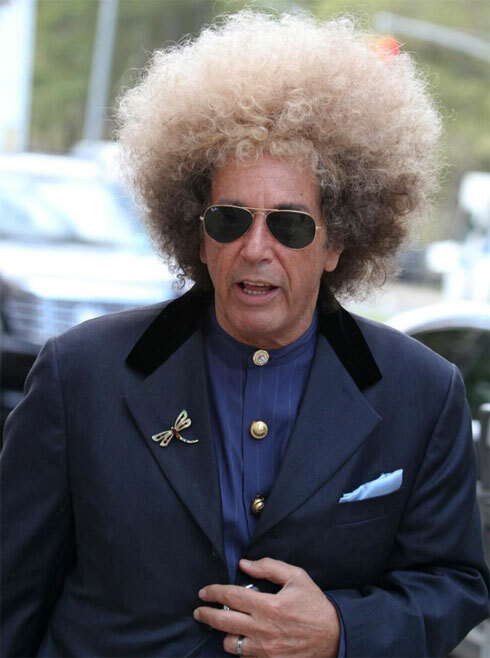 In a strange twist, Phil Spector had always wanted a movie to be made of his life, and being a fan of The Godfather when it came out he had always wanted Al Pacino to play the part of himself. This wish has finally come true, as the playwright David Mamet is in the process of shooting a film based on the trial, starring Al Pacino as Phil Spector and Helen Mirren as his attorney. The Phil Spector story seems to be an ongoing one, causing pain, bemusement and intrigue. There is no doubt that he had the touch of genius at some points in his career, but having had some traumatic experiences in his life, (his fathers suicide, the murder of John Lennon, his young son’s fatal illness) and the heady mix of alcohol, prescription drugs, loneliness and power, all of these things seem to have culminated in one night of horror, the truth of which will never be known for certain. Woah! They certainly went to town on the wig that Pacino wears. Interesting to see the different perspectives on the film from David Mamet and the Friends of Lana Clarkson. Spector seems to create mystery and intrigue wherever he goes.